The apartment has 1 Air-condition unit (12btu) in the living room ,that will keep you cool in the warm summer months and warm in the cool wintertime. It comes fully furnished, with all the Kitchen utensils and plates as well as clean bed sheets and clean towels. The list of items included in the apartment is listed however if there is anything extra you would require, i will be happy to accommodate. This apartment is simply stylish, new , very clean ,very central and has everything you need for your stay without having to bring anything with you on your trip. The apartment does have its own private fast Wi-Fi Internet and wired internet also included in the price. I can even prepare you grocery shopping on arrival if you send me a list of items you will need and they will be ready for you. Alternatively there is a supermarket, only 1-minute walk from the flat. It is perfect if you are coming to visit Cyprus for a holiday or a short stay. The building is located in a very quiet area with beautiful view from all the windows. I can also arrange taxi pick-up, who will have a sign with your name on it, all we need is your flight details. I am from Cyprus, father of three girls.I am electrical engineering specialized in computing and I work in CYTA (Cyprus Telecommunication company) as a technician. I'm very clean and organized person. I communicate very well with people and enjoy to meet and visit new places. My passion are my family and my profession, and i like football very much. 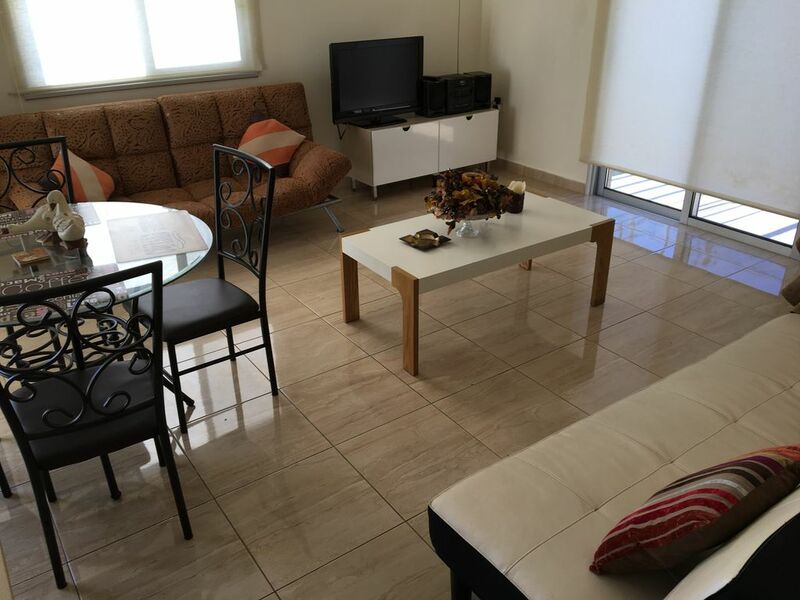 Great place to stay, close to supermarket, cafe, restaurants, beach, Archeological sites. Rosalie is an excellent guest..i will defenetly host her again. The owner was very friendly and waited for us until almost midnight. The apartment is simply beautiful, refurbished, all colours matching, super clean, etc. The internet is very good. There is a small supermarket just 50 metres away. Boasting mountain views, Apartment Ag. Spiridonos 5 is located around a 17-minute walk from Kourion. The Curium Ancient Theatre is within 9 km of the apartment, and free WiFi is provided. With direct access to a terrace, the air-conditioned apartment consists of 2 bedrooms. A flat-screen TV is available. Episkopi Bay is 3.6 km from the apartment. The Apartment is located in Episkopi village. The Episkopi village is located around 15-20 km from Limassol center...around 10 min with the car.